Apple’s Mail is not only easy to use, but also much more powerful than it may appear. If you feel that you’re not making the most of Mail 2.0 (bundled with Mac OS X 10.4), try using these tips to dig into some of its interesting and less obvious features. When you’re trying to find a certain message in your vast and unwieldy e-mail archives, typing a word or two into Mail’s Spotlight search field doesn’t always get the job done. Get the specificity you need by using Boolean expressions. Find It When you’re looking for a specific message in your vast e-mail archives, narrow the search by using Boolean expressions in Mail’s Spotlight field (A) . This works only if you select the Entire Message option (B) . Boolean expressions work in Mail only if you select the Entire Message option. (After you type a search term in the application’s Spotlight field, you’ll see the Entire Message button above the message list.) You can’t do Boolean searches on just the Subject or From field, for instance. ). Then enter your usual Gmail password in the Password field and click on Continue. in the Outgoing Mail Server field, specify your full Gmail address as the User Name, and type your password. Select the Use Authentication option and click on Continue. In the confirmation screen, click on Continue again and then click on Done. 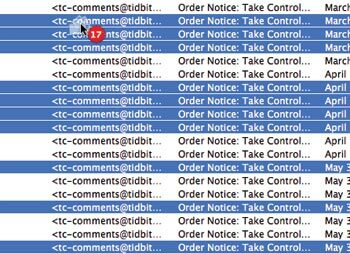 If you’re a Gmail pack rat, brace yourself— a lot of messages will download the first time you access them this way.
) and password. Select the Use Authentication option and click on Continue. In the confirmation screen, click on Continue again and then click on Done. If you’re a .Mac member, you can add up to five e-mail aliases to your account. These extra addresses all deliver mail to your regular inbox. Their purpose is to protect your main address from spam. Use an alias to sign up for online newsletters, for example, or to post on message boards. If the alias becomes flooded with junk mail, delete it and create a new one. It’s easy to use your aliases in Mail. Choose Mail: Preferences, click on the Accounts button, select your .Mac account, and click on Edit Email Aliases. Your Web browser will open to your .Mac account. After you’ve set up one or more aliases here, they’ll appear automatically in the Account pop-up menu in Mail’s message-composition windows. To send a message using the alias as the From address, choose the alias from this menu. Do you have a non-.Mac e-mail account that has more than one address associated with it? For example, the messages for you@example.com and webmaster@example.com might both come to the same inbox. In Mail, you don’t have to set up multiple accounts for each of these addresses to choose one as the From address on outgoing mail. Instead, choose Mail: Preferences, click on the Accounts tab, and select the account. Type the multiple addresses in the Email Address field, separated by commas. Now, before sending a message, you can choose the From address you want to use from the pop-up Account menu. Mail’s Junk Mail Filter is reasonably good and learns from its mistakes, as long as you conscientiously correct them by clicking on the Junk or Not Junk button. But some preference settings can throw it off, resulting in extra spam in your inbox. Check for a common offender by going to Mail: Preferences and clicking on the Junk Mail tab. If the Message Is Addressed Using My Full Name option is selected, Mail gives a pass to any message that uses your full name in the To field. Unfortunately, it’s all too easy for spammers to learn your full name, so I recommend making sure this option is not selected. If you’d like to use it anyway, at least make sure Mail actually knows what your full name is. Go to Mail: Preferences, click on Accounts, and fill in the Full Name field. Mail always displays the number of messages in the currently selected mailboxes at the top of the viewer window. But what if you want to know how many messages you’ve selected? Easy: after you’ve selected the messages, drag them slightly, as though you were going to move them. A red badge with a number appears next to your cursor (see “Pick Any Number”). Release the mouse button before leaving the message list and you’ll know the count, but the messages won’t actually move. Pick Any Number How many messages do you have selected at the moment? Just drag any of the selected messages slightly (without leaving the current pane) and a badge appears on the pointer with the total count. Sometimes you might prefer to send an e-mail message automatically—without having to launch Mail yourself. With a little tinkering in iCal, you can do just that. When you create a new event in Apple’s iCal, you can choose to receive a reminder message by e-mail. But if you’d rather send a reminder to someone else—the forgetful colleague who’s supposed to attend the meeting with you, for instance—download Chris J. Shull’s free iCalMail. if you want to attach the Word file mydocument.doc, located inside the your user folder /Documents folder. 1. Sync without Syncing Even if you don’t have syncing set up (or don’t want to wait for a full sync), it’s easy to send your Bluetooth cell phone a single address from Address Book. Select the contact’s name in the Name list and choose Card: Send This Card. In the dialog box that appears, select your cell phone and click on Select. 2. Get More Options When you have a Bluetooth cell phone paired with your Mac, caller ID information for incoming calls automatically appears on the Mac’s screen. But if you also have Address Book open in the background, and you click on the Bluetooth icon in its toolbar (it turns blue when selected), incoming calls produce a dialog box with even more options. Click on Log Call (before clicking on anything else) to add a note to that contact’s Address Book record stating when the call occurred. Click on Answer to accept the call. Click on Voice Mail to send the caller directly to your phone’s voice-mail system, or SMS Reply to reply to the caller with a text message.